Case reveals possible allergy to this hidden fruit and veggie residue. A 10-year-old girl has a history of asthma, seasonal allergies and anaphylaxis when exposed to cow's milk or penicillin. She sat down to eat a blueberry pie, with none of those ingredients. One bout of anaphylactic shock later, led allergist researchers to dig deeper for the trigger ingredient. What they found concerns us all, and you'll never find it on a label. And not it's not just pesticides. People with food allergies always have to watch what they eat. Now, they may have to watch what their fruits and vegetables eat, as it seems it's possible to have an allergic reaction to antibiotic residues in food. An article published in the September issue of Annals of Allergy, Asthma and Immunology, the scientific publication of the American College of Allergy, Asthma and Immunology (ACAAI), examines the case of a 10-year-old girl who had a dangerous reaction after eating blueberry pie. After weeks of testing on both the young girl and a sample of the pie, the article authors decided that what had caused the reaction was a streptomycin-contaminated blueberry. Streptomycin, in addition to being a drug used to fight disease, is also used as a pesticide in fruit to combat the growth of bacteria, fungi, and algae. 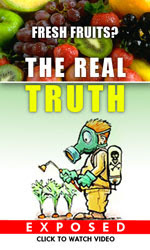 How many people were to assume antibiotics were used in pesticides...in fruit? But even if it doesn't cause a reaction, no doubt people would like to know when they are eating this medication, especially in the face of antibiotic resistance concerns. Unfortunately, this concerns some organic produce as well. As far as we know, this is the first report that links an allergic reaction to fruits treated with antibiotic pesticides. Certain European countries ban the use of antibiotics for growing foods, but the United States and Canada still allow them for agricultural purposes. This is a very rare allergic reaction - Nevertheless, it's something allergists need to be aware of and that emergency room personnel may need to know about in order to help determine where anaphylactic reactions may arise. Anyone who is at risk for a life-threatening allergic reaction should always carry epinephrine. They also need to know how to use their epinephrine in an emergency situation. Just a couple other fruits known to harbor streptomycin are organic apples and pears. Tetracycline and streptomycin are sprayed on organic apple and pear orchards to prevent fire blight, which can wipe out a whole orchard. This exemption is allowed under organic standards, as a replacement wasn't initially made when fire blight broke out. The upcoming ban on tetracycline on apple/pear orchards this October has possibly pushed researchers into finding a suitable replacement, an allegedly safer version of copper solution, for what it's worth. When popular astrophysicist Neil deGrasse Tyson spoke against critics of GMOs, he scoffed: If you’re the complainer type, go back and eat the apples that grow wild… they’re something that’s this big” [mimes tiny area with hands] “and they’re tart… they’re not sweet like red delicious apples. We manufacture those. That’s a genetic modification. No, it's really not. But this was his way of demonstrating "progress" to ridicule those who have valid concerns about questionable food practices by painting them as Luddites in stark contrast. But I don't see the "progress" in a large, sweet apple if we're unwittingly being dosed with un-prescribed, unlabeled antibiotics.